K-Laser Therapy is one of the newest and most effective treatments to relieve pain and heal injuries. This non-invasive, therapeutic treatment uses a Class IV laser in order to reduce pain and inflammation while simultaneously accelerating tissue regeneration and healing. K-Laser’s innovative, new technique uses specific red and near-infrared wavelengths of laser light to induce a photo-chemical reaction and therapeutic effect. K-Laser Therapy treatments are quick and highly effective. Treatments last between 5 to 10 minutes depending on the injury/condition. It may seem short; however, the therapeutic effect continues to sooth and heal long after you leave our wellness center. Pain Relief: Laser therapy has highly beneficial effect on nerve cells which block pain signals transmitted by these cells to the brain which decreases nerve sensitivity. Laser therapy also relieves pain by reducing inflammation. Accelerated Tissue Repair and Cell Growth: Light from the lasers penetrate deep into tissue and accelerate cellular reproduction and growth. As a result, the cells of tendons, ligaments and muscles are repaired faster. Anti-inflammatory: Laser therapy has anti-inflammatory properties. It causes the blood vessels to dilate and stimulates the lymphatic drainage system which helps reduce swelling in acute injuries. Improved Vascular Activity: Laser therapy will significantly increase the formation of new capillaries in damaged tissue thus speeding up the healing process. Release of Trigger Points: Laser therapy stimulates muscle trigger points allowing them to release. Long Lasting Results: The biggest benefit of K-Laser Therapy is that it produces long lasting results. K-Laser Therapy is about healing not masking or covering up pain. It accelerates your body’s natural healing process giving you a cure not a band-aid. What Conditions Can K-Laser Therapy Help? How Does K-Laser Therapy Work? Watch the video below to learn about how this new, innovative, and highly effective technique works to stimulate healing and eliminate pain. Yes, K-Laser Therapy is completely safe and is approved by the FDA. It is the safest, most effective, non-invasive, painless therapy available. In the last 30 years there have been over 2,500 published studies worldwide and 100 double-blind studies that have shown that laser therapy is safe and effective. 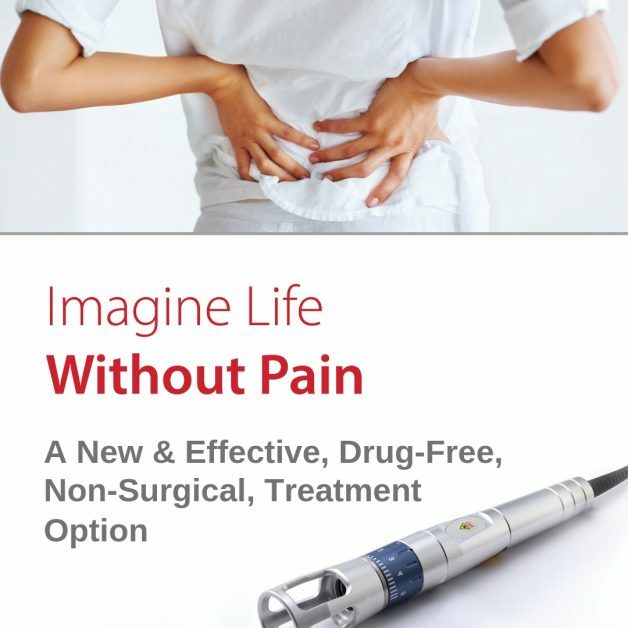 Because of this, many patients are opting out of risky traditional pain management options, such as pain pills and invasive surgery, and instead choosing K-Laser therapy to safely treat their pain and injuries. How Many K-Laser Therapy Treatments Are Needed? The results of K-Laser Therapy are cumulative. Although many patients will experience relief after the first treatment, it takes multiple treatments for the injury/pain to fully heal. The number of treatments needed depends on your diagnosis, age, and overall health status. Typically, acute conditions require fewer visits, around 4-6 on average. Chronic conditions typically require more visits to properly treat the problem, around 6-10 on average. I’ve Tried Laser Therapy Before & It Didn’t Work? All lasers are not the same. K-Laser therapy is different from Cold Laser Therapy and other laser therapies out there. Because of the new and innovative technique K-laser uses, many patients that have tried cold laser therapy and other types of laser therapies without success end up finding relief with K-Laser therapy! The main problem with other laser therapies is that they use lower classes of lasers which only penetrate 1/8 of an inch into the skin. This means these types of lasers aren’t capable of targeting pain that stems deep into the muscles. K-Laser Therapy (Class IV Laser Therapy) is able to penetrate deep into the muscle to stimulate repair and ease deep muscle pain. The NFL, MLB, NHL, NBA, PGA, NCAA and Olympics have all turned to this new, innovative therapy to make sure their athletes are at peak performance. Professional Ballet Dancer, Alessia Lugoboni, was shocked by the results she’s been seeing from K-Laser therapy. Watch the videos below to hear how K-Laser therapy has helped Professional Ballerina, Alessia Lugoboni, and the New York Yankees! 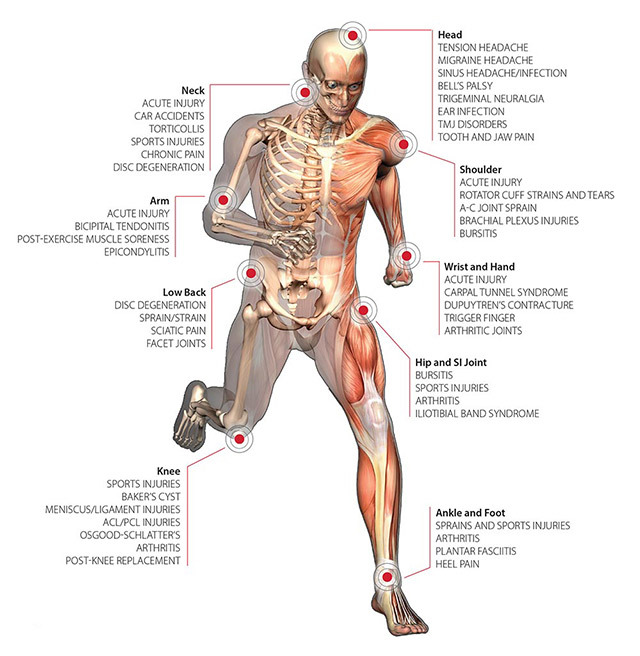 If you’ve tried everything and had no luck relieving your pain, stiffness, inflammation, or muscle spams we can help. Give us a call at 703-436-1512 or fill out our contact form to learn more about K-Laser Therapy.